It’s a horror story with a dystopian twist. The recent terror attack in an upmarket ,swanky cafe is depressing me terribly. This was followed by 3 more acts of unbelievable violence . 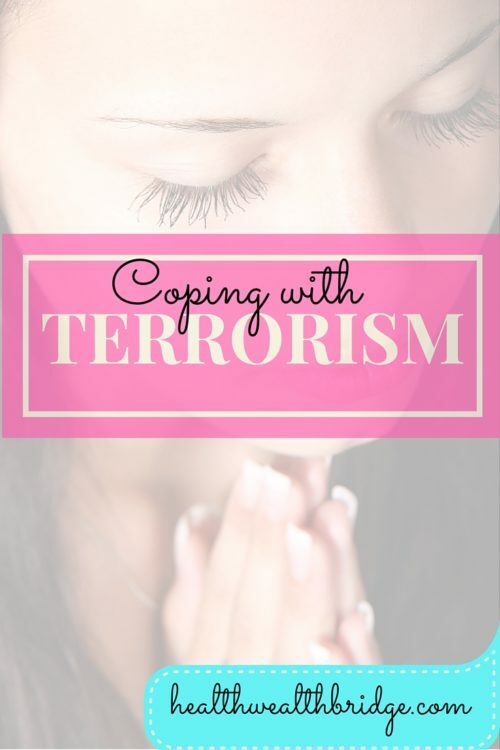 Living in a democratic country with a pot pourri of religious belief, the dark cloud of terrorism is an unwanted threat to your happy mind. Your mind likes being happy.But now it doesn’t know. You know it’s not about religion . It’s about wanting to be the one who everyone fears. This kind of madness few witness twice in their lives. You are the post Independence generation. Females specially have a lot to thank for . 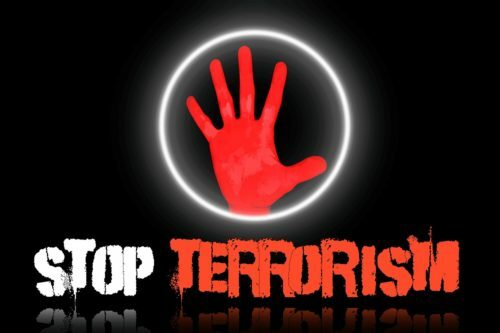 The dark horror of terror attacks ,is spreading its poisonous tentacles of xenophobia. History will tell you how many times mad rulers have tried to rule the world. And how many times they succeeded. They win if you are afraid. In this country you are lucky. You have a voice.This voice is most important. Even where “I “is actively practiced ,people who spread terror want something more . They want subjugation.They don’t want tolerant ,moderate brave voice. They want to kill non believers. Some of the religious preachers claim they don’t support killing innocents. Obviously anybody who is a non believer is not innocent. That’s pretty smart right! If you don’t support these people, they might even call you intolerant. But there are worse things than being called intolerant. If you are carrying out a crime or supporting a crime..Both cases you are guilty of the crime. That’s why there’s something called “accessory to murder”. Religion is a way of life. Killing people cannot be a way of life. It’s a way of death. It’s almost like a Stephen King horror..with blood gore and psycho killer. Only this time there are many . Machete wielding, gun totting,suicide bombing ….interesting set of skills. If they are real ,what would you say about the possibility that they are injected full of hallucinogenic drugs. The people who recruit and train don’t die.Its the trainees who die. The horrors are too many.While mourning, one another happens. Todays gift :some coping skills. Maybe little.But it’s a beginning. Insomnia are some of the frequent effects of viewing violence on and off-screen. Even reading about them often causes panic attack. You stop exercising .Start binge eating, looping thoughts ,cribbing about small things . 1)Start reading mystery novels.You have to be ready to save the world. Learn how to break away from hypnotism. 3) Avoid the news if it makes you feel better. 4)Cuddle your child or anyone else you might want to (within limits). Help as many people as you can, in any way . 7)Try to talk about it without becoming panicked. 8)Spread awareness as much as you can. 9)Avoid using alcohol or drugs for coping.It will make the problem worse. the face of tragedy and trauma? Maintenance of self-care ,helps you keep up normalcy. 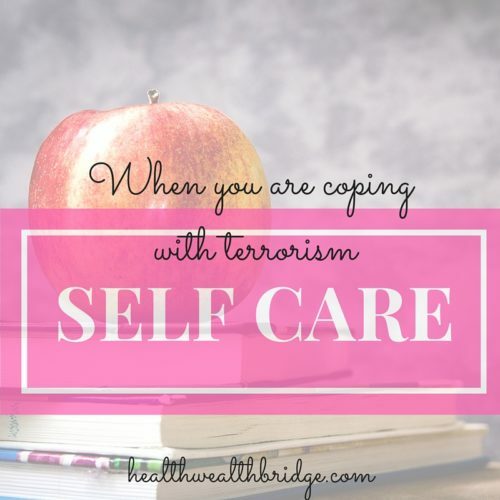 It’s an important step in coping.When self care is absent ,it’s a danger sign. Then you might be needing medical help. Don’t forget to put on lipstick even when you are worried(not recommended for men, not a good look). Try to eat healthy even when you just want to binge. Whatever your religion or colour ,we are actually children of the same God. Try to hold on to that thought. Spread a little goodwill ,in any way I can. Praying for the world.Let us all survive to fight another day. This post is a part of Day Two #HalfMarathon #DailyChatter at the Blog Chatter. Awesome post on such a serious topic! What a timely, but extremely important subject. Practicing self-care through these situations and beyond will make one so much more healthy and able to cope. Yes Beth it’s best to show that terror will not stop us from living.Women can give life and have great power.That’s why awareness is important without panic. I especially liked your tip about reading mystery novels. I watched The Walking Dead, and I always think about having to be ready for anything. Yes Danielle that’s my best coping skill .I can totally zone out of the mind loop with a great book😊.What’s your best coping tip? Beautiful post. I am personally very angry and shocked about what has been going on lately. It feels so overwhelming and like there is nothing I can do. Your post really hit home for me. Thank you. Yes Melanie ,the sense of helplessness and lack of control makes things very difficult. I am glad you liked this post. Great tips. The media can really mess with your thoughts! It is important to take care of yourself. Great post. It’s so important to practise self-care. Great post and so true!! Practicing self care is so important! You spoke so much truth on a difficult situation that is plaguing the world right now Thanks for your consideration and tips. Thanks Lakisha .I appreciate your encouragement. I’ve been really troubled with these attacks recently, so I’m glad you’re talking about it. The only thing we can control is ourselves and the love we show towards those around us. Hi Jessica I am troubled too.Life is too short for all this. But sometimes you really can’t be an ostrich. That’s why I decided to write about this .Speaking about it can break the horrible hold that these attacks have on our minds.Thanks for sharing your thoughts. Practicing positive thinking is the biggest takeaway here. Thanks Kylie.Yes I felt slf care practice gives us time to cope. What a beautiful, poetic way to put this. I also love that you emphasized strategies for coping with the trauma and stress. Self care is so so so important as is holding your loved ones close. This is such a timely piece, thank you so much for sharing it. Thank you Beryl for reading this and your very kind comments.I think we have to be really strong when bad things happen close to home.But now everywhere it happens its always close.The world has actually gotten smaller beccause of the internet.Wonderful ways and not so wonderful ways.Truly appreciate your feedback. This post is spot on and really resonates for me. I’ve gotten to the point where I don’t watch the news at all. I can’t take the constant onslaught of terror information. I agree, my time is better spent trying to spread kindness and love. Hi Jessica.I truly appreciate your kind words.Times are different.Even online kindness makes me grateful.Thanks for reading. It was such a nice read, and those weere some great tips! Thanks Khansa .I appreciate your feedback. It’s about control and subjugation. What a pity that we never become civilised enough to live and let live! It appears to be some sort of brain virus/mutation or effect of drug.Everyone understands except those who are doing it. Good information and need of the hour! Yes Deepa dfinitely I felt so too.Thanks for reading.